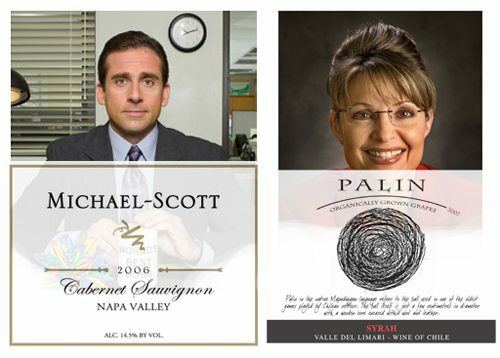 Michael-Scott wines (above) have been around since 1998. Then, from out of nowhere, everything changed in March of 2005. That’s when The Office debuted on NBC, with Steve Carell in the lead role as the hapless Michael Scott. There is no word on whether this hit show has been good or bad for the winery, in Sebastopol, California. “It was our best selling wine before (the V.P. announcement),” said Chris Tavelli, owner of Yield Wine Bar, which has offered Palin Syrah, a certified organic wine from Chile, by the glass since July. But after Sen. John McCain tagged Sarah Palin as his running mate, sales of the wine with the conservative’s inverted name plummeted — not surprising in famously liberal San Francisco. The Palin Syrah is organically grown in Chile.